"If you are considering ADC Films, I would strongly recommend the services they offer. We are looking forward to working with them on future projects.” Sports Direct. “ADC Films always deliver on time with high quality work. Highly recommend”. Everlast. “A great quality video that was a huge attraction at the national housing show”. MK Council. At ADC Films we are not only experts in video production but are also creative script writers, which will help to achieve maximum impact for your video. We pride ourselves on providing a friendly, professional and cost effective solution to your video production needs. We help you get the best out of whoever is talking about your business. From professional audio setup to filming attention grabbing footage, we make your testimonials stand out. From hotels to golf courses to cars and big industrial companies, many types of businesses can benefit from including drone footage in their video production. A drone can show your customers aspects of your business that were simply not possible in the past. From your logo appearing creatively and maybe text overlays, we ensure the motion graphics match your style of video. Video production of business presentations is now referred to as a “webinar”. This is a great way to share content with many more people than were able to attend the initial event, meaning less valuable time out of the office for your staff. Our professional set up ensures your webinar looks and very importantly sounds great. Script writing is the start of the vast majority of videos we are commissioned for. A script decides what is to be filmed and what is to be said. It is from the script that we design the “storyboard”. This is how, as videographers, we decode the script into visual scenes. At ADC Films we have an in house script writer that can help you develop a script that ensures your storyboard and production day(s) go smoothly, giving you a great final product. The edit is where we piece together your footage, getting everything in your video that was in the initial brief. We use industry standard software which ensures your final edit looks as good as possible. From making audio sound amazing to colour grading and motion graphics, we ensure your final edit engages the target audience. more time on a website with video. People stay 2 minutes longer on a website that contains video for services or products and this results in more leads, eventual sales and puts you ahead of your competition. At ADC Films we are not only experts in video production but are also creative script writers, which will help to achieve maximum impact for your video. We pride ourselves on providing a friendly, professional and cost effective solution to your video production needs. Testimonials are a very powerful marketing tool, we help you get the best out of whoever is talking about your business. Whether you have one or six people to talk about the benefits of your business, we make sure the final video is edited so as to keep the target audience interested and make that all important call to action. From professional audio setup to filming attention grabbing footage, we make your testimonials stand out. From hotels to golf courses to cars and big industrial companies, many types of businesses can benefit from including drone footage in their video production. A drone gives smooth footage that no other production method can achieve and will show your customers aspects of your business that were simply not possible in the past. Many videos need some level of motion graphics included. From your logo appearing creatively and maybe text overlays, we ensure the motion graphics match your style of video. Anything is now possible with motion graphics and our software is the same as what you see in major Hollywood productions. Having a professionally produced training video(s) for your business is a much more concise and efficient way of conveying your message to staff or users of your product, and also something that can be referred back to at any time. From internal training videos to online instructional guides our full service video production delivers a polished end product. Video production of business presentations can also be referred to as a “webinar”. This is a great way to share content with many more people than were able to attend the initial event. Our professional set up ensures your webinar looks and very importantly sounds great. The edit is where we piece together your footage, getting everything in your video that was in the initial brief. We use industry standard software such as, Adobe After Effects, Davinci Resolve and Final Cut Pro. This means your final video will look every bit as professional as any major brand out there. From making audio sound amazing to colour grading and motion graphics, we ensure your final edit engages the target audience. 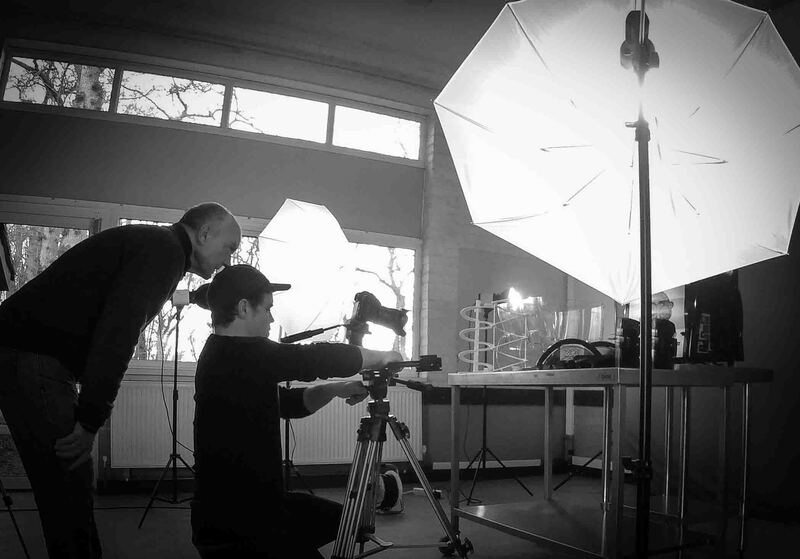 Preferring to be behind the camera, here is a rare picture of both Adam and Andy on a product video production shoot. Adam and Andy have a combined experience of over 40 years in professional video production. As well as backgrounds in video and photography, we have extensive experience in marketing disciplines,. This is a vital component when meeting with you to decide the best and most effective way of showcasing your company’s strengths and uniqueness to prospective customers. With experience of working in the national media for product launches and magazine shoots, Adam brings all the technical ability to your production day. From ensuring the best camera positions to creative editing, Adam is all the technology at ADC Films. Having been the marketing director for Olympus cameras, Andy is now the head script writer for ADC Films. With a vast experience of creating video scripts for promotional videos as well as training videos, Andy brings huge creativity and experience to your project.